Staying warm while wrapping up! 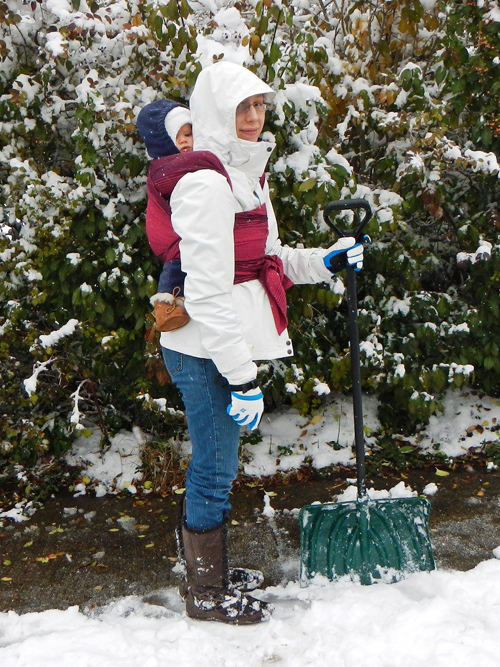 A coat made for two is the most convenient way to keep warm for winter babywearing. What is Your Winter Wrapping Style? The Amazing Back-Seat Maneuver: when you park at the mall, you might have a big enough vehicle that you can climb into the back seat, close the door, and put baby into your carrier before you get out. You enter the vehicle as a regular person, and emerge like a costumed superhero with baby all wrapped up! The Pop and Go Express: if it doesn’t work for you to do it inside the car, you can plan to wrap outside the door of your car. 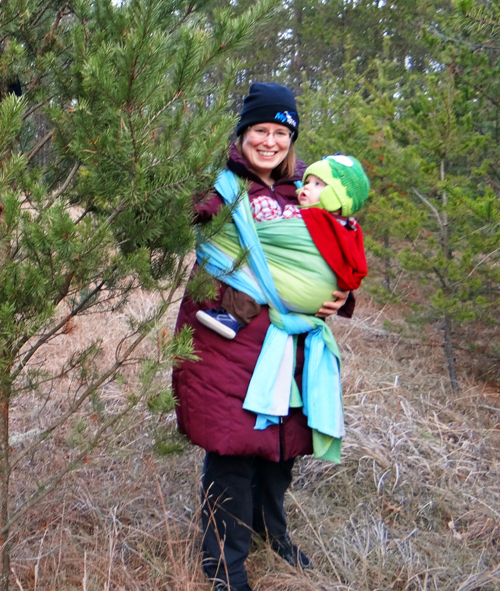 A pre-tied carry like Front Cross Carry will be the fastest and is perfect for winter babywearing. Pop baby in, then close your coat (already on) around you both and head for the door. You can use a babywearing coat works best for fitting around both of you without letting in the cold but any large coat could be used if it keeps you warm enough. 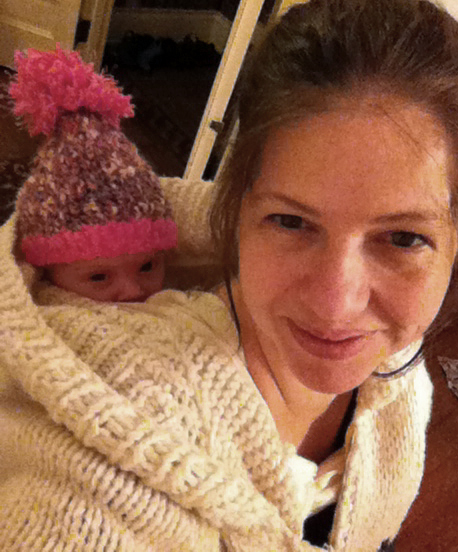 The Arms-Full Hustle: a third great winter option is to grab the wrap, and the baby, and hurry inside, where you can then get wrapped up at leisure once you are out of the cold weather. This works best if you do not become nervous when wrapping in front of onlookers! If you and baby are not wearing separate coats, then you’ll want to hold baby inside your coat for the hustle. Does your coat go OVER or UNDER your baby carrier? A further decision to be made is whether to wrap over your bulky winter gear, or to layer over your wrap job. I vastly prefer bundling up after wrapping up but I recognize that there are circumstances in which the other method may be more useful. It is a lot easier to get a nicely tightened, attractive and comfortable carry when you are NOT wrapping over bulky sweaters and coats. Some winter gear is slippery material and it may not be safe to wrap over such material. 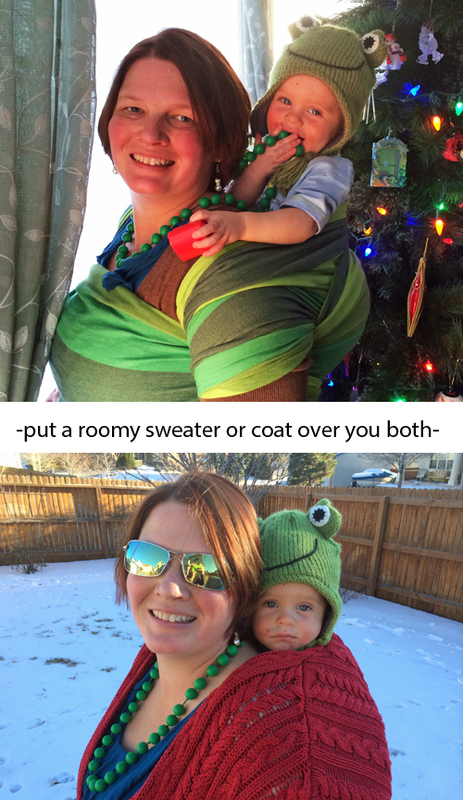 Bundling yourself and your baby individually means that you lose the benefit of combined body heat and also knowing how warm your baby is so as to prevent bundling too much and overheating the baby. 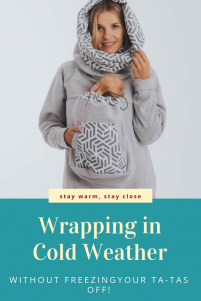 If you are going to a place where you and your baby or toddler will want to remain bundled up after coming out of the wrap, it might be handy to have individual winter wear on each of you, and to have the winter wear underneath the wrap. This way you can remove your child and your carrier without removing your coat. This might be handy if you are going to walk to the park, for example, where your child will be coming out of the wrap and going to play on the playground. However, you could achieve the same level of convenience with a poppable Front Cross Carry under your coat. While you are walking, your coat wraps around both of you and keeps both warm. 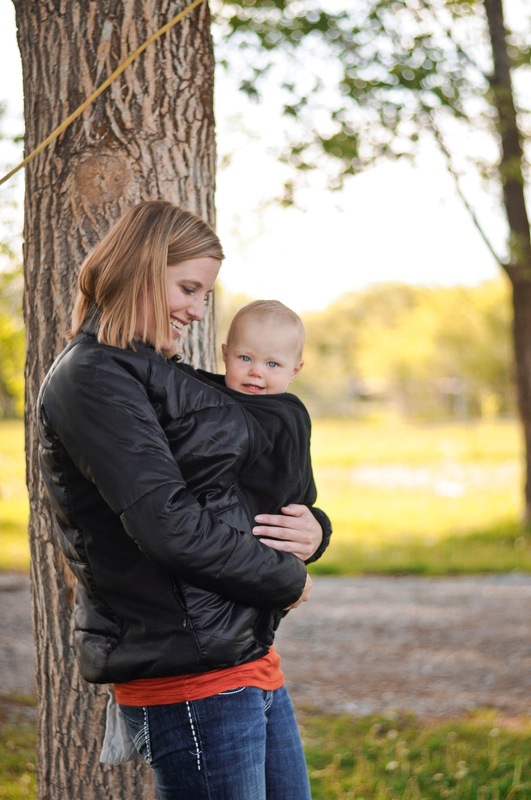 When you arrive at the park, your child comes out of the carrier and you will either need to bring a coat to put on your kiddo at that time, or you can have your child wear a coat over the wrap, with the front open. The wrap comes up under the coat so when you pull baby out of the wrap job, you do not need to remove the coat. Just button or zip and off they go! If you are going to be spending some time outside in the cold while staying wrapped up, such as shoveling the walk or taking your older child to the park,you can wrap your baby up at home, and then the warmest option is to put one coat over both of you. You can use a large coat: your husband’s, a coat that is a size too big for you, or a maternity coat. Or you can purchase a specially made babywearing coat, which is made with specific attention to keeping both parties warm all over while easily accommodating a child in a wrap. It can be a more graceful option for front or back carries. 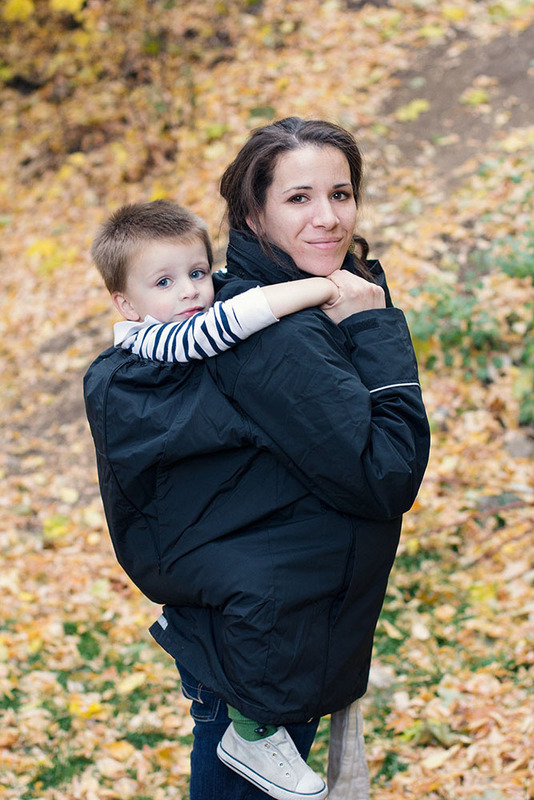 The Deluxe Kindercoat even accommodates hip carrying! 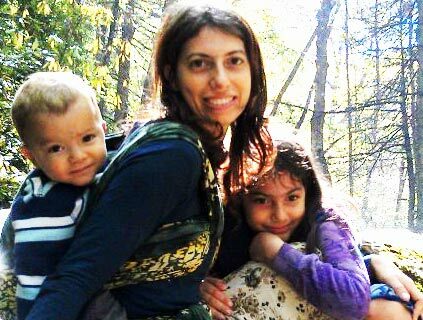 There are also easy-to-use Babywearing Sweatshirts that slip over both of you in the baby carrier. 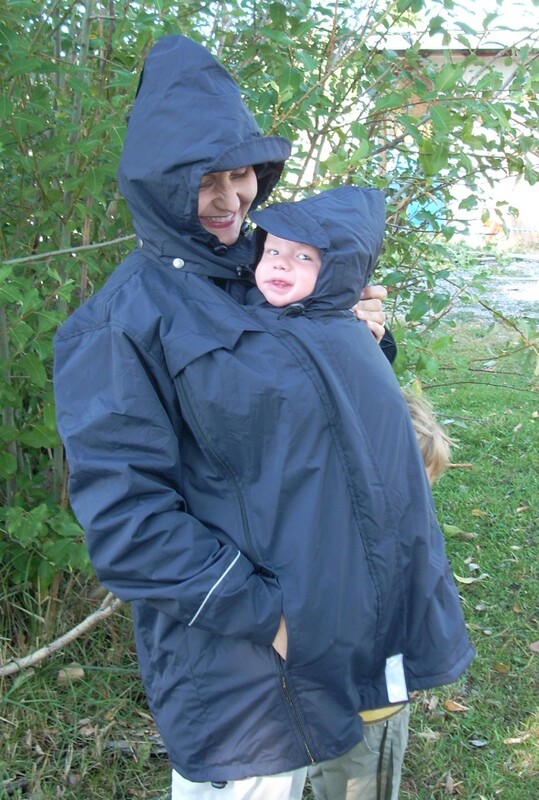 If you are using a coat not made for babywearing, you will probably want a scarf to cover your chest above baby’s head (in a front carry) or to cover the back of your neck above baby’s head (in a back carry) as the two of you will be sharing one head hole. Baby in a front carry in the baby carrier – wrap your own winter coat around to zip up over you both. Baby in a back carry in the baby carrier – put your sweater or coat around the both of you, leaving plenty of room for baby’s head to share the head hole with you. Caution: If putting your coat around both of you, do not put a coat on baby under your coat as well. 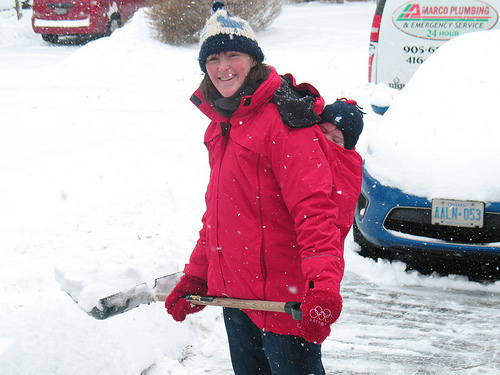 Over bundling in winter can lead to dangerous overheating of babies. If your coat is warm enough for you, it will be warm enough for baby. And remember, your combined body heat is adding extra warmth compared to just wearing your coat solo! Can a wrap work for quick, easy, ins and outs in winter? 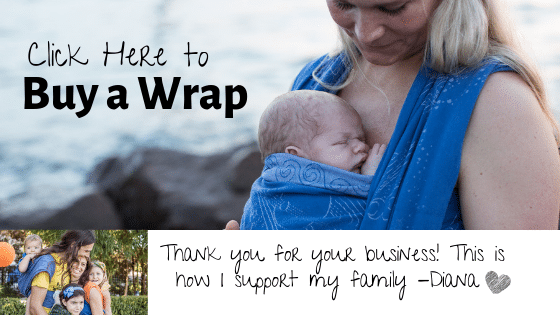 For frequent ins and outs, as when running errands, you can use a pre-tied wrap carry which you put on at home so that when you park in a parking lot you can quickly pop baby into the wrap without wasting time out in the cold getting your carry together. You leave your coat on over the carry, and simply close it over the both of you for fastest warmth. Remember that children should not wear coats in carseats as any puffiness that requires loosening of the straps can render the seat unsafe, so you should have a blanket for baby in the carseat, anyway. A pre-tied carry is also handy for not dragging your wrap in puddles, mud, snow, or slush. 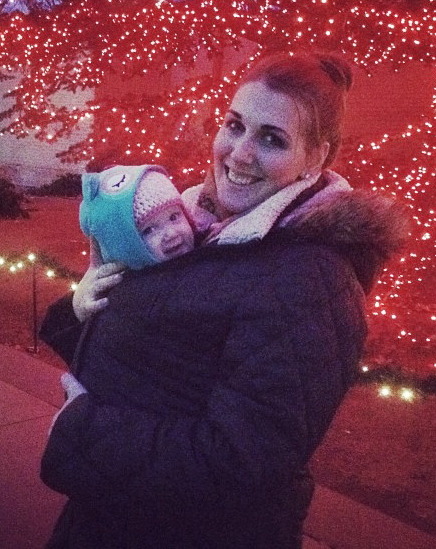 Front Cross Carry is your best bet for a poppable carry for winter babywearing! 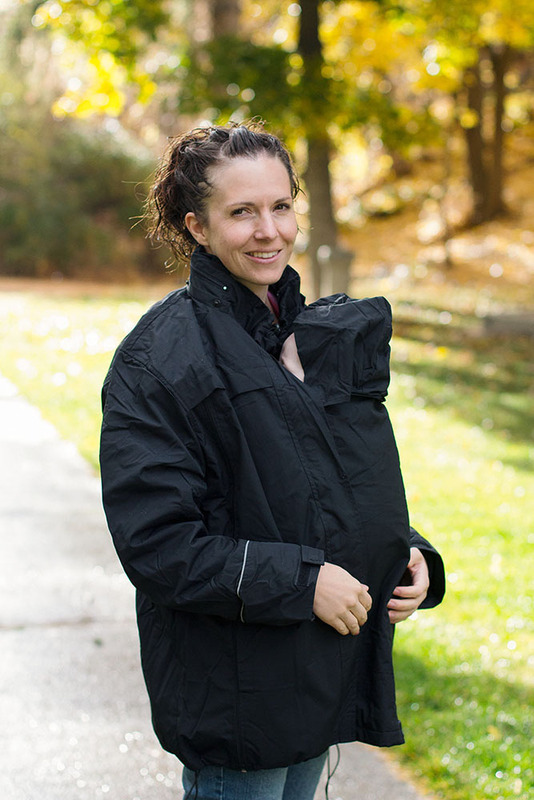 I offer several babywearing coats, jackets, ponchos, and different kinds of covers as well in my store and you can check out the options here.